If you often walk or hike in snow, you need the right gear to ensure you travel across the snow without struggling. Acquiring the right gear in this case involves finding high quality snowshoes. Snowshoes have recently gained popularity due to their effectiveness when it comes to walking on snow-covered ground. Getting yourself a pair of high quality snowshoes will see you have fun during the winter season outdoors rather than indoors. This article will carry out ten best snowshoes reviews to help you pick the best pair there is on the market. There is a wide variety of snowshoes in the market, and you are required to consider a couple of things before settling on a particular brand. Most importantly, you should know that snowshoes are not a one-size-fits-all kind of products. If you are wondering what to look out for in snowshoes, here is an idea of what to look for. On what terrain will you be using your snowshoes? When buying snowshoes, you need to establish whether you will be using them to hike steep terrains or on flat terrains. Snowshoes are designed to suit different terrains, and you should get the ones designed for your specific terrain. For instance, snowshoes made for steep trails are made with more crampons for traction as compared to those meant for flat trails. Usually, snowshoes are designed to help you walk on snow. As such, weight distribution is a factor put into their design. As such, be sure to check the weight limit of the snowshoes you are buying. Note that the weight limit of your shoes will also include any luggage or gear you will be hiking with. Whom are they meant for? Snowshoes are designed for men, women, and children. Each pair is constructed to suit a particular people. Men’s snowshoes are designed to handle large boots and heavier loads. On the other hand, women’s snowshoes are narrower, and they have curved frame designs to fit women’s footwear. Kids’ snowshoes, however, are designed according to age. Snowshoes either have rotating/floating bindings or fixed bindings. The former pivot at the point where they attach under the balls of your feet. They allow easy movement on steep/icy terrain and deep snow. Their pivoting, however, may make it hard for you to move backward or walk over obstacles. On the other hand, fixed bindings do not pivot much because they are connected with heavy-duty rubber, providing comfortable strides. They allow walking over obstacles and moving backward. The shoes you wear should be compatible with your snowshoes for maximum comfort. 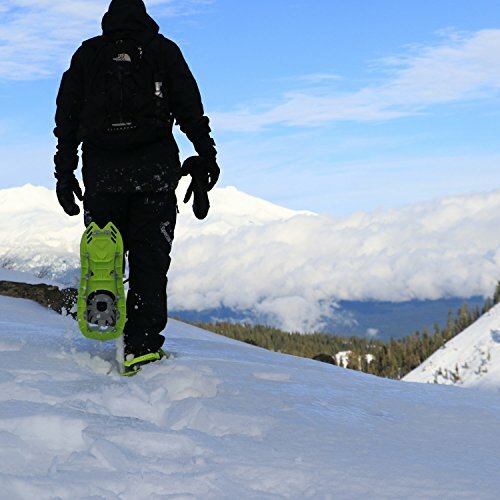 If you are looking to undertake some snowshoeing this winter, you might consider getting yourself the Chinook Trekker Snowshoes. These snowshoes come highly recommended because they are built with a sturdy aluminum frame. They also have a lightweight and ergonomic design, which allows you to walk easily with optimal comfort. These snowshoes also feature easy-to-use dual ratchet bindings and heel straps that have quick release buckles. They also have UV resistant polyethylene decking. With these snowshoes, you do not have to worry about walking on snow because they come with heavy-duty aluminum crampons that offer excellent grip into the snow. They also have heel crampons that make walking down fair slopes easier. The Chinook Trekker Snowshoes are ideal for individuals weighing between 59 and 90 pounds. These snowshoes measure 18.9 by 7.5 inches, and they are light measuring 3.91 pounds. Additional features and accessories on these snowshoes include mesh ventilation, side handles, a carry bag, and Velcro pole carriers. All these make walking on snow much easier. If your fiancée adores snow hiking, For the female snow hikers out there, you might consider the Tubbs Snowshoes Women’s Xplore Snowshoe. These also make a great gift for your partner. The snowshoes are constructed with a biomechanical aluminum Fit-Step frame. The frame is curved slightly upwards with a rounded tail, which significantly minimizes the muscular skeletal impact on your leg joints. It also features a rotating toe cord that bites into the snow to make snowshoeing much easier. The snowshoes have QuickPull binding cinches that are easy to unlock in addition to the pivoting toe stop that allows quick adjustment. Moreover, the Tubbs Snowshoes Women’s Xplore features carbon steel toe and heel crampons that provide a firm grip when going uphill, downhill, and moving side hill. • The buckles tend to loosen up after some usage. If you want your kid to follow your footsteps in snow hiking, you should consider getting him or her the Tubbs Kids’ Snowflake Snowshoe. 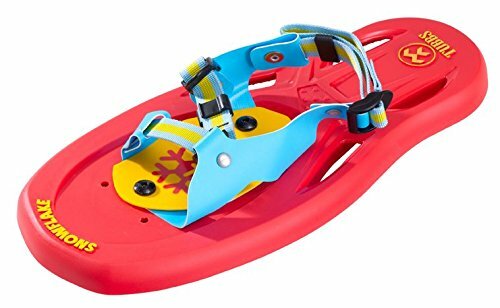 This snowshoe comes in yellow, red, and blue, implying that you can get your kid a pair that has his or her favorite color. This is a great starter snowshoe for kids aged between 3 and 6 years old. This snowshoe is either made in USA or imported, and its design features the synthetic-and-mesh style. 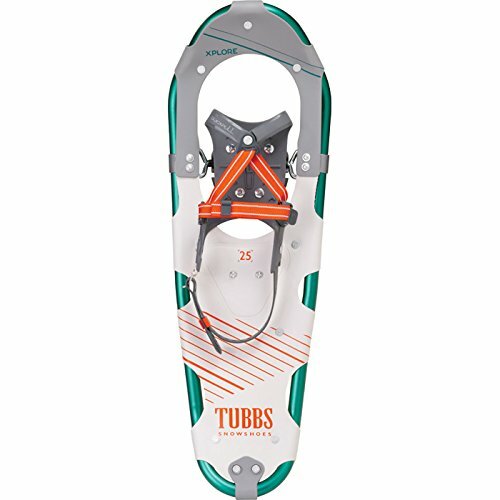 Another feature that makes the Tubbs Kids’ Snowflake Snowshoe great is its 2-step binding, which is quite easy to use. Moreover, it includes a sticker pack. This snowshoe is designed to suit kids who weigh under 50 lbs. This snowshoe is designed to handle a maximum load of 120 to 200 pounds. So, if you and your hiking luggage have such weights, this may be the snowshoe to go for. This snowshoe features SoftTec decking that offers durable, lightweight floatation on snow. It is also fitted with carbon steel toe and heel crampons that bite in the snow firmly. This snowshoe measures 8 by 25 inches, and its frame is curved up with a rounded tail to minimize impact. What’s more, this snowshoe has QuickPull binding cinches that make it easier to unlock. 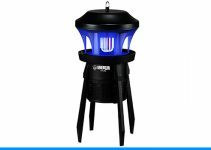 Moreover, it has a rotating toe cord design that allows its tail to drop and discard snow. 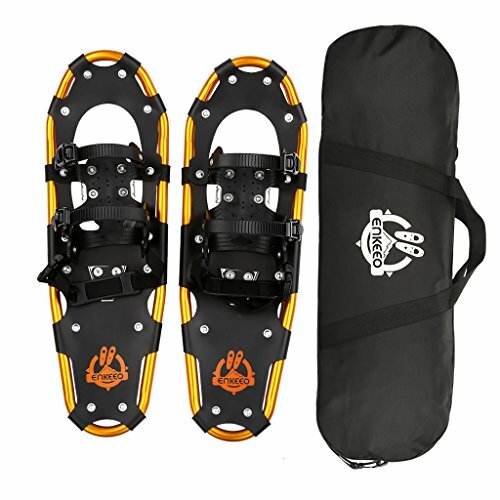 If you do not know what gift to get a brother who loves snow hiking, you should consider getting him the Crescent Moon Gold 10 Backcountry Snowshoes. These snowshoes are designed for men who weigh up to 225 pounds. These snowshoes measure 10 by 32 inches, and each pair weighs 4.9 pounds. The Crescent Moon snowshoes are ideal for backcountry snowshoeing, and they are designed with large single-pull loop binding to hold the feet comfortably in position. With no readjustments needed, these snowshoes are easy to wear and get off. They are also well designed with a frame that allows easy floatation. The decking is not only durable but also has a lightweight design. 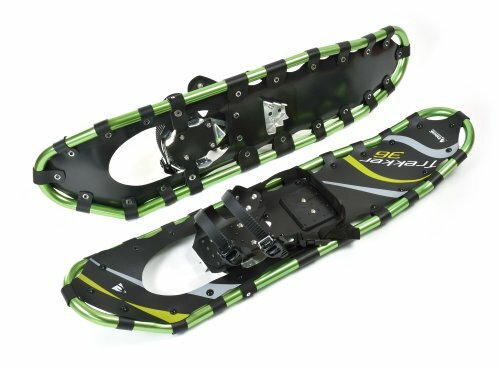 Other outstanding features on these snowshoes are the 3 high profile, stainless steel crampons. These crampons are situated underfoot to offer excellent grip as you maneuver through different terrains. It also has an authentic toe claw that provides your foot with the power you need to go uphill. Another snowshoe in the list specifically for women, is the Crescent Moon Gold 13 Mountain Hiking Snowshoes. This is one of the best snowshoes for women and makes a great gift. These snowshoes are best suited for women who weigh up to 165 pounds. They are ideal for hiking through packed snow and trail conditions. The snowshoes’ frame features a teardrop design to enable you to stay above the snow. This shape allows you to walk or run without having to change your steps. The frames are made from sturdy aluminum tubing (6063 aircraft grade). These snowshoes’ traction is enhanced by the 3 crampons stainless steel system that allows you to walk through any terrain. Additionally, the Crescent Moon Gold 13 Mountain Hiking Snowshoes for Women’s decking is resistant to abrasion, are durable, and features a lightweight design. They also have a toe claw to help you climb mountains easier. Moreover, their Single Pull Loop binding is made of a flexible polymer that keeps your feet in position, while enhancing comfort. Undoubtedly, the Louis Garneau – HG Men’s 1036 Blizzard II Snowshoe is one of the best snowshoes on the market that you could get yourself. Just as the name suggests, it is meant for men. This shoe features a sturdy and lightweight construction with a frame made of 6061-T6 anodized aluminum. The frame is curved to increase the surface area, which enhances its floatation qualities. The snow shoe is easy to use, and it comes with a single BOA closure system. Its crampons are made of high carbon steel, and they allow you to walk on any terrain conditions easily. Other outstanding shoes that could not miss from this list are the ENKEEO All Terrain Snowshoes. These shoes are made of aluminum alloy, and they are designed for anyone who admires both comfort and fashion. They feature an ergonomic and streamlined design to make it easier for you to walk through snow-covered grounds. The shoes’ double ratcheting bindings are easily adjustable to fit a wide array of footwear. Its decking is designed to allow you to stay afloat the snow, and it has a strong metal frame that enhances stability. Its crampons are made of aluminum alloy to allow acute traction. These snowshoes are recommended for individuals of up to 160 pounds. 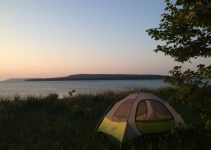 They are good for hiking adventures because they come with a carry bag for portability. 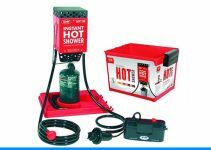 In addition, they are made from lightweight yet durable material. They also have a TPE heel strap for excellent support. When it comes to snowshoeing and fashion, women cannot go wrong with the Winterial Yukon Snowshoes 2018. With an attractive pink color, these snowshoes are recommended for women who weigh between 140 and 190 pounds. The shoes not only come with anti-shock poles but also have a lightweight design. Moreover, they are designed with sturdy aluminum frames to let you walk on steep, snowy terrains. With heel bindings and aluminum teeth, you can rest assured that they feature aggressive traction. • If the poles are not sufficiently tight, they may come apart easily. Louis Garneau has put in a lot of work to come up with the HG Men’s 825 Blizzard II Snowshoe – one of the best snowshoes on the market. This shoe is designed with the 6061-T6 aluminum anodized frame, which contributes to its strength and lightness. The snowshoe also comes with a lifetime warranty, meaning you do not have to worry about its durability. Moreover, it features a single BOA closure system. Just like most of Garneau’s snowshoes, the 825 also features a curved frame. The frame enhances the surface area to provide efficient floatation. The 825 Blizzard also comes with Traxion crampons that are made of high carbon steel to provide the needed grip on all snow conditions. • Doesn’t support a wide range of boot sizes.